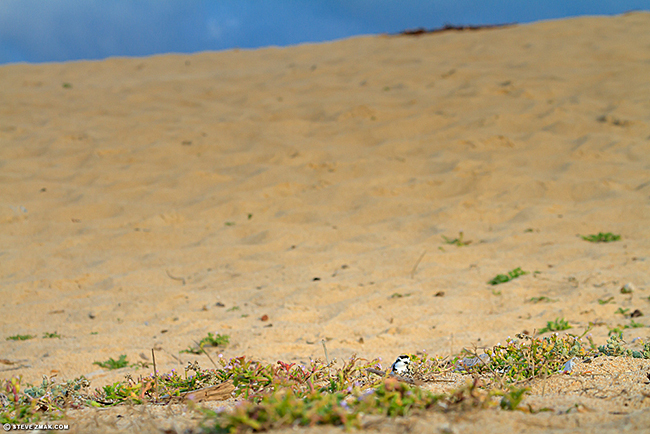 Western snowy plover nesting in undisturbed habitat currently on the site of the proposed Monterey Bay Shores Resort. (Photographer: Steve Zmak). The Chapter continues to oppose development in 39 acres of beachfront dune habitat for federally protected western snowy plover. In addition to Dr. Peter Baye, coastal ecologist and Dr. Scott Cashen, wildlife biologist and foremost authority on western snowy plover, the Chapter has now retained avian ecologist Michael Morrison to comment on the Project developer, Ed Ghandour’s Habitat Protection Plan (HPP). The Project calls for a 1.34 million foot mixed-use resort in Sand City which entails approximately 680,000 cubic yards of grading, utility extensions and infrastructure, and related development (e.g., roads, parking lots, signs, and lights). The chief concern is the long-term presence of breeding western snowy plover (Charadrius nivosus nivosus) on this site. •	Snowy plovers react to human disturbance, even when the source of disturbance is a considerable distance away. Studies have shown that snowy plovers require a buffer zone free of human disturbance that extends at least 100 meters from the nest site. Plovers did not acclimate to, or successfully find refuge from, human and human-related disturbance; feeding rates also declined with increased human activity. The Project site is not large enough to install effective “nest protection zones” for snowy plovers. •	The HPP divides the Project site into multiple “habitat management areas”. There are two proposed areas for nesting comprising of about 10 acres. Human access to these areas will be developed including three beach access ways, a public vista point, and two private resort vista points. Thus, plovers will be confined to two management areas that will have substantial human visitation. Based on the known intolerance of plovers to human activity within a mean distance of 80 m (262 feet), and the known distribution of plovers across the Project site, no locations within designated management areas will allow for occupancy, let alone successful nesting, by plovers. •	The HPP includes a Predator Management Plan (PMP) which acknowledges that multiple species could be responsible for predation of plovers and their nests, yet provides no specific plans on how predator management might be implemented. Dr. Morrison concludes that the HPP and PMP are hopelessly vague with regard to all aspects of plover management. He states it is evident that the HPP and PMP will completely fail to reach the goal of retaining plovers in the Project area. Therefore, there is no doubt that “take” of the western snowy plover will occur associated with implementation and operation of the Project. (Attached is Dr. Morrison’s full letter and scientific references).